Development of phonation and speech, oral-motor control, and general motor function is dependent on the smooth integration of respiratory support during those functions. This video addresses the concepts of respiration as they relate to the development of function. 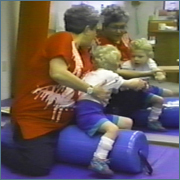 Treatment techniques are demonstrated for establishing respiratory control as a support for functional motor activity.